Nintendo's Handling of the Switch: Two Steps Forward, One Step Back | Nerd Much? If you haven’t heard, Nintendo launched a new console last week. And by most accounts, it was relatively successful. Nintendo Switch units are difficult to find. It’s touting impressive sales numbers. And it has one of the most critically praised games of all-time in its library. What could be going wrong? Well, actually, a lot. I’m a huge Nintendo fan. Have been since I could pick-up my older brother’s NES controller in the late ’80s. So it pains me to no end when I see the company that I love make the same mistakes over, and over. With the Switch, we mature Nintendo zealots hoped this was the chosen device. — the one that would justify our years of solidarity. And to a degree, it did. So far, I’m enjoying my time with the Switch. But the launch of the system as a whole is classic Nintendo – two steps forward, one step back. Once people began getting their hands on the Switch in January, we all began to hear rumblings that the Joy-Cons just weren’t up to par. Held sideways, they were too small as individuals. As a pair on the Joy-Con Grip, they weren’t comfortable enough to be your primary controller. Nintendo solved this potential issue with the launch day release of the Nintendo Switch Pro Controller. You would just have to drop an additional $70 to get it. Okay, console controllers are expensive these days, I know. So maybe you don’t need a Pro Controller, and instead opt for another pair of Joy-Cons. A package of two is $80. Steep, right? So just buy a single one for a potential 3rd Mario Kart player. $50. This isn’t to mention the Joy-Con Charging Grip being priced at $30. Or even a second Nintendo Switch Dock Set for your bedroom maybe – $90. The entry fee to the Switch is $300. And, you’re absolutely going to buy Zelda, so we’ll say $360. Tack on the almost essential Pro Controller and we’re at $430. That’s the cost to boot up and play day one for a lot of people. And you’re going to need another set of Joy-Cons eventually – now we’re up to $510. Before tax, mind you. 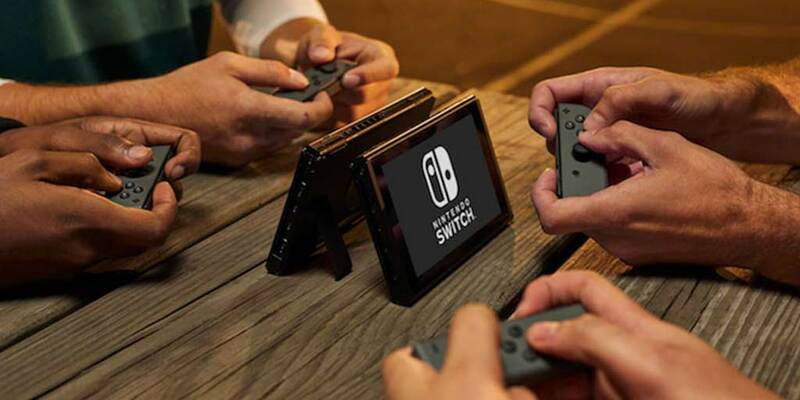 I’m sure there’s a lot of technology in those tiny controllers (while the Dock itself not so much), but it certainly feels as though we’re being nickel and dimed by Nintendo. The above is taken a bit out of context, but really, it’s not far from what Nintendo is putting out as a statement. Pixels are the very fabric of our gaming visuals. They’re the magical little dots that transport us to those foreign worlds. So when they aren’t functioning properly on a screen, it turns something miraculous into a jarring experience. But hey, Nintendo says that’s “normal”. No! That is not “normal”, Nintendo! That is the very definition of a defect. That “support” note is nothing but a tone-deaf scapegoat of a statement to try to dissuade users from sending back their damaged Switches. It’s a lazy, cost-cutting preemptive strike. And worst of all, it’s a huge “screw you” to your dedicated fan base. The Switch does comes with a one to two-year warranty depending on the country of purchase. So even with their stance on dead pixels, you shouldn’t have an issue getting a replacement product. Not to mention that retailers also have return policies that should give you plenty of time to find an issue and swap it out for a new console. I know LCD screens can have issues, and Nintendo has to cover their back to an extent. But my point remains — why come across so haphazardly and nonchalant? A defective screen is a big deal. When consumers come looking for help, that “statement” shouldn’t be what they stumble across. Listen Now: The Nerd Much? Podcast – Switch and Zelda, Does Anything Else Matter? One of the vast appeals of Nintendo’s newest console is the thought of a seemingly endless Nintendo library I can take anywhere. NES, SNES, Nintendo 64 games anywhere! There were even rumors of GameCube titles making their way onto the service as well. But the January 12th presentation came and went. And not a peep was uttered regarding the service that has been a tradition since the Nintendo Wii. January wrapped up. February neared to a close. And still, Nintendo had yet to give clarification as to whether their newest console would launch with the beloved service. Then they finally did. And at that point, it was what we had expected; there would be no Virtual Console on the system at launch. At that time this was a devastating blow. There was little to expect outside of Breath of the Wild at launch. And if we couldn’t download some classic Nintendo titles to accompany our new Link, it could spell trouble. Luckily, Nintendo circumvented this by getting a solid group of independent titles available for the Switch’s March 3rd release as well. However, the lack of Virtual Console games on Nintendo’s new darling seems like an egregious omission. It’s just not bad enough that the Virtual Console isn’t on the Switch. We have no idea when – or if – the functionality is even coming. That’s hyperbolic, but confirm that it exists, Nintendo! Best case scenario at this point would be a reveal of an all new Virtual Console service at E3. Show how it can be used in conjunction with Nintendo’s upcoming premium online offerings. A subscription plan like the one Microsoft is rolling out, maybe? E3 is only three months away at this point. Just please, show us something. No one has ever been a fan of Nintendo’s Friend Code system. Ever. It’s cumbersome and obtrusive. Luckily, we were told by the company that the system would no longer be utilized going forward. Well, they lied. Friend Codes are back. Though thankfully, they aren’t the sole way to connect with your fellow gamers. Regardless, having the Friend Code system in-play whatsoever just muddies the waters. No one ever liked it. And just hearing that it’s back on the Switch made the world collectively groan — just get rid of it! Who is it serving? You can avoid the system entirely, as I said. You can reference a list of players you’ve recently gamed with and add friends that way. You can also add local players around you or just send a simple friend request via name. So again I ask – why are they back at all? It’s just another baffling decision. The Nintendo Switch was a console launch that seemingly could have knocked expectations out of the ballpark. Instead, it was merely mediocre. I won’t harbor on the left Joy-Con’s connectivity issues. Or how your game saves are locked onto one system. Nor the fact that Nintendo plans to charge in the near future for their online services. That wouldn’t be fair, anyway, as we still don’t know what the really even entails. But so many were ready to be all-in on this console, and it feels like Nintendo fumbled it at the line of scrimmage. All is not dire, though. The device itself is impressive. And the Nintendo Switch is reportedly selling quite well. And perhaps most importantly, software support (at least in the form of independent titles) seems to be on the way. We just have to hope that Nintendo will get its act together as they get it up to speed through the rest of 2017. And then hopefully, hit 2018 full steam ahead.